Celebrating Christmas is probably the most widespread tradition in the Western world. Though it originally was a holiday of peace, harmony and the time of year when the whole family is together, this event often turns into convention. Instead of calm, it brings chaos, anxiety and a lot of money is gone. Wouldn’t it be nice to reminiscence about the essence and the origin of Christmas? How did Christmas traditions originate? The generally known purpose of Christmas is to remind us of Jesus Christ being born. The Church brought this to light in the 4th century. This is why on the 24th or 25th of December the majority of people get together under the Christmas tree. At the utter beginning, this time was known as the celebration of winter solstice. The celebration was worshiped by Slavs, Germans and Nordic nations. All these nations celebrated the approaching spring, gifts of the future, a new life dormant under the snow and a strong and growing family. Many of them eventually became the symbols of Christmas integrated with Christian concepts. The day of Jesus’ birth was also considered as the first day of the New Year in middle ages. In those times, many customs, ceremonies and rituals were performed during the Christmas holidays. People believed that they could positively influence their future lives and the upcoming harvest. Different plays, songs, were performed in costume. The children went from house to house with rhymes or songs and people gave them sweets or money. It was very similar to today’s Halloween. Not many of us can imagine Christmas without the Christmas tree. Its shape as we know it today appeared at the end of the 18th century. Until that time the green branches were hanging on doors or from the ceiling above the table. They symbolized the prosperity and protection from demons and bad powers. In a few houses, people took the branches away after dinner and put them into manure (it could help transfer the negative energy into the ground.) 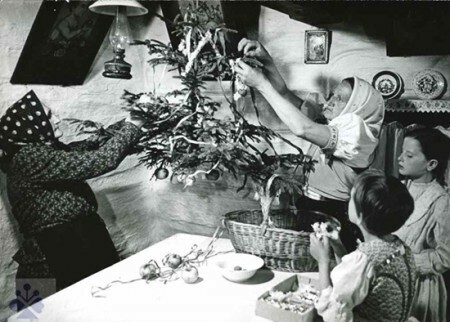 In some other areas (Northern and Eastern Slovakia), boys prepared a straw tree and before dinner they brought it to the house. It was a symbol of the previous harvest and the anticipation in the next one. Only later were fir, spruce or pine trees used and decorated with apples, nuts and honey-cakes. 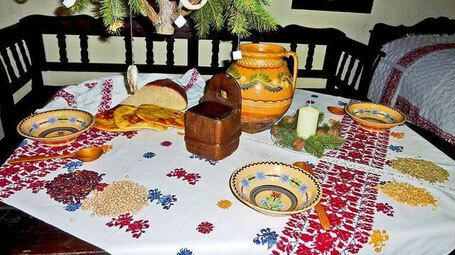 The time of winter solstice was connected with celebrations where a lot of food was served. When Christians took over these holidays, the Church ordered a fast on the 24th of December. The Roman Catholics were only allowed to eat fish and meat after midnight! In contrast, the Evangelical faith was allowed to eat fish and other meat products. During days around Christmas, everybody ate some onion or garlic in order to gain protection from witches and to be healthy. The garlic was usually eaten with wafers and honey which was also believed to have magical healing power. Many cakes, breads and others dishes from dough (e.g. ´lokše, štedrák, medovníky´) were also prepared for carol singers and visitors. The dough could be used for another ritual. If a housewife wanted her hens to lay eggs she cleaned her hands from the dough in the yard. If she wanted a tree to bear fruit, she would put the dough on the trunk of the tree. One of the first foods eaten on Christmas Eve was fish (the scales of the fish symbolized money and wealth) and in some regions people eat ´opekance´ or ´pupáky´ with poppy seeds. Soup was not to be forgotten. In Slovakia people either ate the traditional cabbage soup into which beans, dried fruit and dried mushrooms or fish soup. This soup was to be eaten very slowly in order to prolong your life. The evening meal started when the first star appeared in the sky. The oldest man or woman made a wish or a toast. Then apples and nuts were used to predict the future. The Christmas Eve meal had a strict order of courses and their number was magical e.g. 7 or 9. In some households they used to take only three bites from one particular meal. Housewives took pieces of each food and threw it to the animals or into the well to guarantee plenty of water. Another traditional part of Christmas was the serving of alcohol, such as wine, ´slivovica´ or ´hriatô´. They were served during visits. Neighbours visited each other and treated themselves with many kinds of food. On the 25th of December smoked meat and sausages could be eaten. On St. Stephan’s Day, some small kids used to go around with verses and poems. Grandmothers brought their children and decorated cakes. After the Christmas dinner cut an apple crosswise, if the kernel appears in the star shape it means that you will be healthy the next year and if the kernel is rotten it will bring the disease. Attention if there is a cross shape, death is ahead! Take scales from carp and put them into your wallet. Also eating lots of lentils and beans should bring you money for the next year. Use a chain to encircle the table, it should prevent household separation. The problem is that nowadays the chain is not in homes so often. The folk tradition says, “Under the mistletoe everybody can kiss”. People believed that the crumbs from bread and others foods had supernatural powers during Christmas Eve. They would be added into crops, used for the first seeding or used for healing and love potions. Do not eat the whole day and you can see a golden piglet in the evening. People used to believe that if a person got lost and thought of somebody with whom you sat by at the Christmas table, this memory would find him on the right path home.